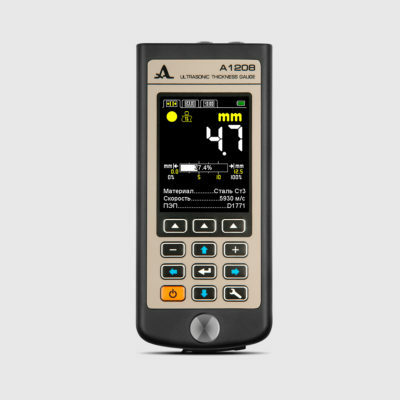 The thickness gauge can operate at the mode of displaying results as digital data or at the mode with graphic imaging of the signal A-Scan. 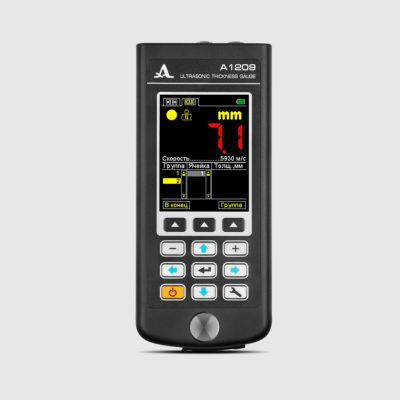 The A-Scan feature rules out false results considerably increasing the inspection reliability. It makes possible to perform express search of foreign inclusions and laminations and to get accurate results of measuring through polymeric (polyethylene), varnish and paint and other types of insulating coating. -patented auto correlated algorithm of measuring for pinpoint accuracy of results eliminating the influence of the single-crystal transducers’ near field zone at small thickness. The large TFT display ensures full visual control of the inspection process with the help of color indication. The cover with build-in magnetic holder helps to fix the thickness gauge safely to metal surfaces for comfort work at hard-to reach places and at heights. Thickness measurement of pipes, boilers, vessels and variety of other metal parts as well as cast iron, plastic and other materials with high ultrasound attenuation. – scanning of the inspection objects. – perform measuring at corroded surfaces as well as at flat smooth surfaces without any additional adjustments, which makes the process of inspection much easier and faster. 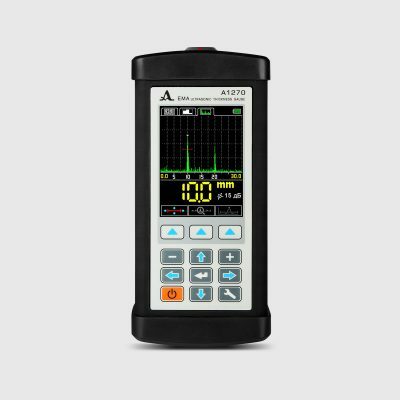 – obtain reliable results when performing measurements through polymeric (polyethylene) and other types of insulating coating in the A-Scan mode.